One of the most interesting things I got an inside look into on this trip was the organisation of looms and owners of machinery to share factory space in order to ensure maximum efficiency of any loom at any time. I stumbled upon this concept when I was speaking to a silk merchant who works with multiple looms. Over coffee I was asking him about the cost of capital associated with each machine and he was referring to one particular weaving company and their equipment when he explained that a deal was done between the owner of one company and another to merge all the equipment into one building. The basic gist of it was that if all the machines were under one management then the likelihood of one machine ever sitting idle was diminished. In many instances the loom will produce around the clock in many of these factories located around the hills and back country of Lake Como. And from my understanding the machines in most instances run seven days a week although it was explained to me by another contact that they have Sundays off. And if you thinking weaving is a set and forget problem you are mistaken. Since most companies produce a limited number of metres in any given design, artwork needs to be constantly revisited and the contrast threads chosen need to change on the loom too. 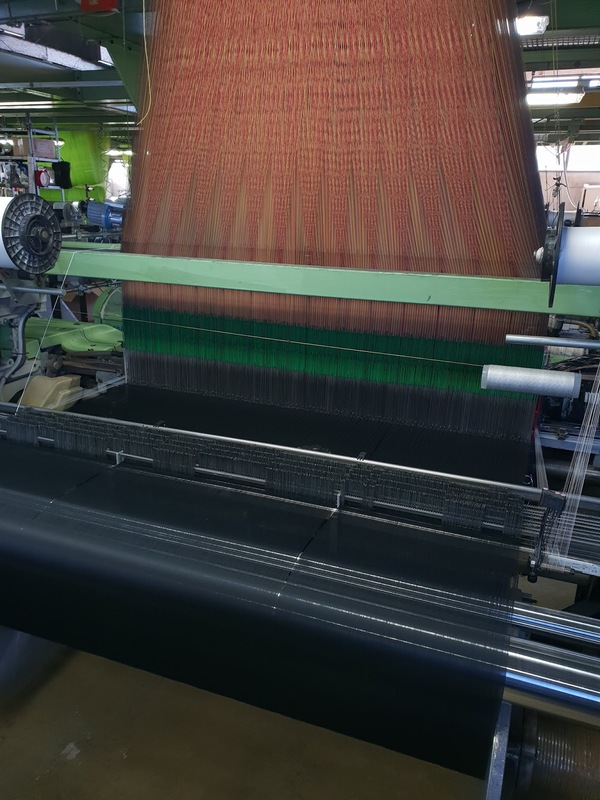 Then there is the warp, which, if any single thread breaks, a needle drops and the machine comes to a halt until a technician repairs the broken thread. My appreciation for the Italians that run these facilities only increased the more I thought about the time and energy that's required to keep a factory like this open for business. Warps need to be prepared, machines need to be calibrated, weft threads need to be loaded and prepared for the shuttles. Even after a decade of going back and forth to the looms I do not in anyway presume to know exactly what is going on as I watch the fabric coming together line by line. It's fast, it's noisy and though it seems rather simple when you think about it conceptually, there is a lot of work going on to make it look that simple and fast. And of all those machines that I witnessed, it was perhaps the darling of Otto Mantero, his triple warp grenadine silk weaving machine, a piece of machinery that was built one hundred years ago, which was clacking away with it's timber frame producing the most exquisite grenadine, that fascinated me most. It was like watching someone who had finely tuned an old Ferrari and it had such a gracefulness about it as it clanked back and forth that it was visually mesmerising. If you go to Como, it's worth stopping in to the silk museum where many earlier versions of these machines as well as visual histories of sericulture and weaving from the area give you a real understanding of an industry that's been in operation in this area for hundreds of years.